The opening 96 lots of the sale at Skinner (23% buyer’s premium) in Boston on December 4 were from the stock of the former New York dealership Edith Weber Antique Jewelry. The family firm, founded in 1960 by Edith Weber, was once among the leading US dealers in antique jewellery, trading from The Carlyle hotel in Manhattan. Son Barry Weber, who joined the firm in 1975, appeared on 15 seasons of the PBS Antiques Roadshow and taught hands-on jewellery appraisal classes at several colleges and universities. Well known for his stock that championed the rare and the esoteric over the easy sale, “we are fearless in our taste”, he said. That taste, betraying a remarkable sensitivity towards mourning art, was writ large in the opening 96 lots of Skinner’s sale with more offered online later in the month. A Renaissance gem-set gold and polychrome enamel gimmel ring sold at $14,000/£10,800 (estimate $15,000-20,000). Set with a sapphire and an emerald, the two parts open to reveal the engraved biblical text Quod Deus Homo Non Conjunxit Separet, which translates to ‘What God hath joined together, let not man put asunder’. 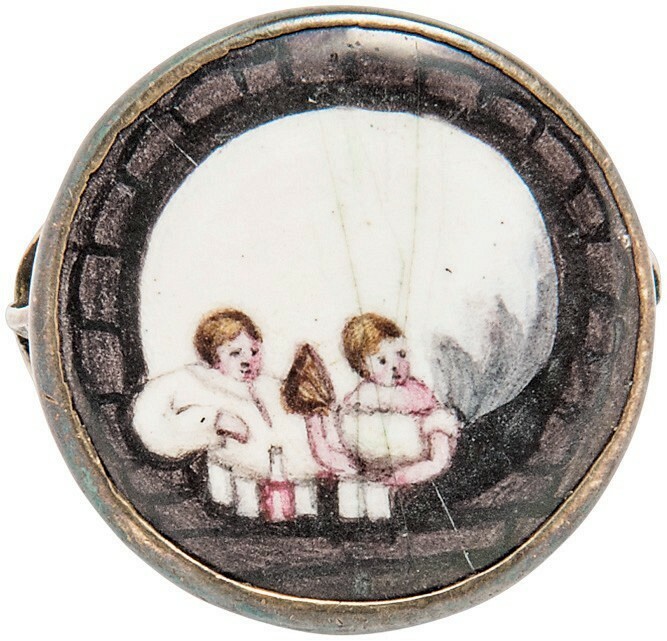 Another ring to this design, probably made in Germany in the late 16th century, was sold by Woolley & Wallis in November for £7500. 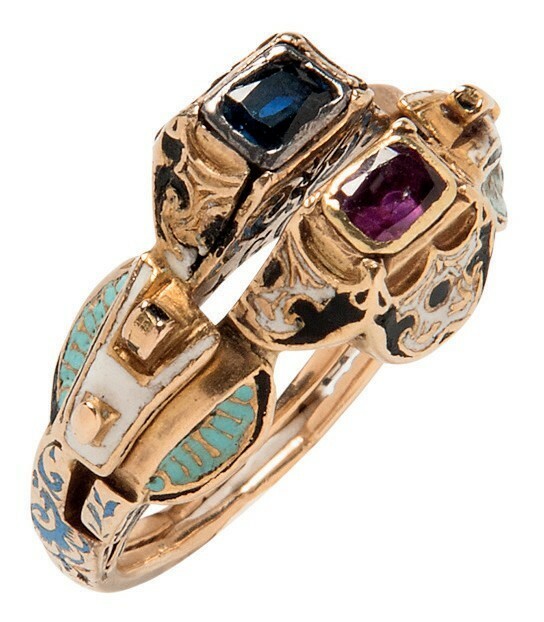 Renaissance gem-set gold and polychrome enamel gimmel ring – $14,000 (£10,800) at Skinner. Mourning jewellery, much of it produced in the period in the formative years of the US, has traditionally found particular resonance among collectors in North America. The pieces in the Weber sale were of a quality that recalled the Schorsch collection sold by Freeman’s of Philadelphia in November 2017. 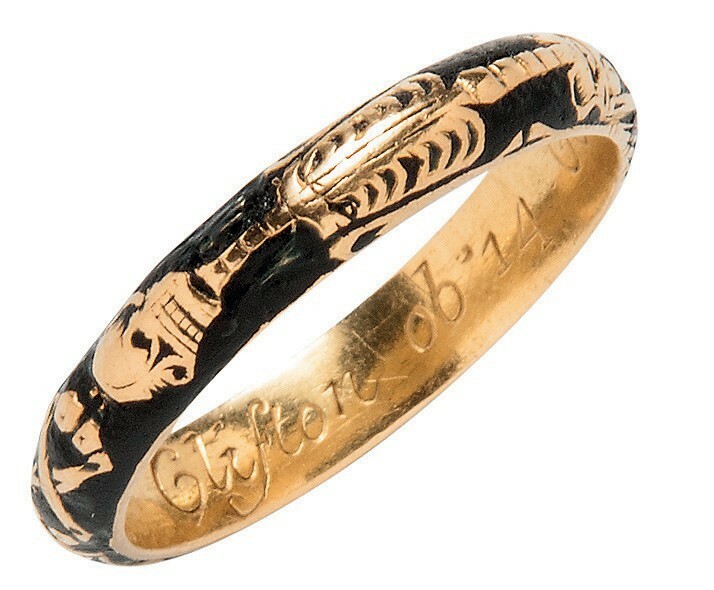 Two early 18th century English gold rings, both picked out in black enamel with skeleton, hourglass, and a pick and shovel, were pursued well beyond expectations. One, with a skull under a rock crystal coffin and the inscription G Baker obt 8 Apr 1722 took $6000 (£4600) while another engraved Reb Glifton ob 14 OI 1733 aet 37 brought $8500 (£6550). The jewels made in England and France in this period are among the most graphic and artful expressions of death – often functioning as both general ‘memento mori’ reminders of the brevity of life and memorials to the loss of specific loved ones. Estimated at $500-700 but sold at $8500 (£6550) were two gold slides c.1700, one a Stuart crystal with the unusual motif of a winged hourglass, the other enamelled to one side with a skull and crossbones and the motto Tous les moment nous y conduisent. Perhaps most striking of all was a ring enamelled with a skull that on close inspection was an optical illusion. Two seated children formed the eyes teeth of the upper jaw. A graphic reminder of the staggering rates of child mortality common to both rich and poor in Georgian Britain, it sold for $5000/£3850 (estimate $1200-1800). Highlights elsewhere ranged from an Art Moderne silver ring by Jean Despres with a provenance to Andy Warhol (sold for $8500/£6550) to a 1940s platinum and diamond brooch fashioned as a Short Sunderland flying boat (sold for $10,000/£7700). 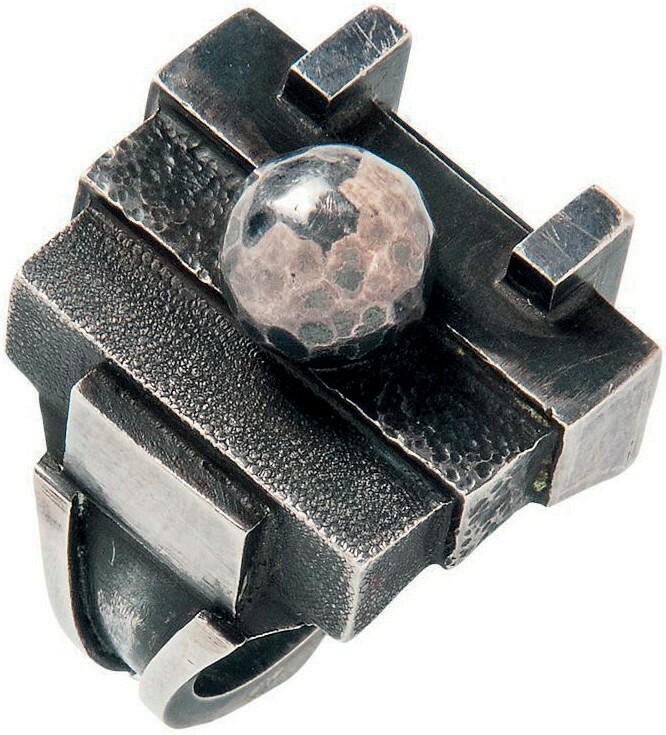 Art Moderne silver ring by Jean Despres – $8500 (£6550) at Skinner. 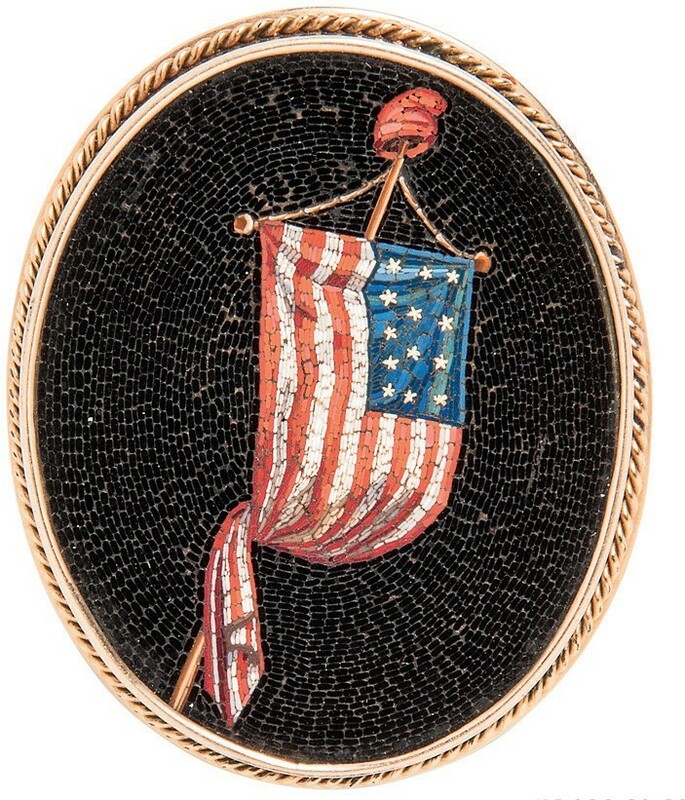 A rare – and, in New England, a predictably popular entry – was a gold-framed mosaic depicting the Stars and Stripes complete with liberty cap hanging from the flagpole. The flag depicted was the original 13-star ‘Betsy Ross’ – the number of stars growing to 15 in 1795 with the addition of Kentucky and Vermont to the states of the union. Estimated at $1000-1500, it sold at $11,000/£8500. A Van Cleef & Arpels ‘Raja playing a lute’ brooch c.1947 with rose-cut diamond head, cabochon emerald body and ruby and diamond accents doubled hopes at $13,000/£10,000. A similar example is pictured in Set in Style: The Jewelry of Van Cleef & Arpels. The name of the Viennese jeweller Ernst Paltscho is less well known today but connoisseurs continue to appreciate both his Art Deco designs and the exceptional workmanship. 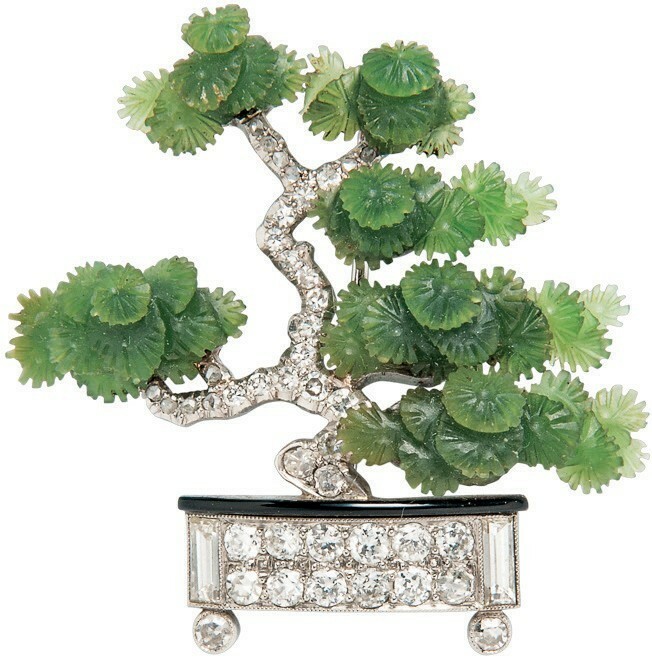 A gemstone ‘japoniste’ brooch c.1920 in the form of a bonsai tree in a red enamel pot formed part of the famous Hull Grundy collection of jewellery that was donated to the British Museum in 1978, where it remains on display. Another version of that same brooch, here set with diamonds, carved hardstone leaves and black enamel, was offered in the original fitted box. The hammer price was $22,000/£16,900 (estimate $3000-5000).